Famed for the Kurinji flower that blossoms only 12 years once, Kurinjiandavar Temple is a significantly known temple of Kodaikanal. It is situated just 3 km from mesmerizing Kodaikanal Lake and is devoted to the God of Hills, i.e. Lord Muruga. Decoding the meaning of this temple’s name, Kurinji stands for hill area and Andavar refers to God, so that is why this temple is called as Kurinjiandavar named after the Hill God Muruga. There’s quite a lot of traffic during the tourist season so try to visit the temple by early morning to avoid crowded environment. Cameras for photography and video making are not allowed. The temple management charges 5 rupees for parking. The popular Kurinji Flower that blossoms in 12 years and is said to be visible in 2016 last, hence the flower is a must sight to be seen. There are many shopping outlets inside the temple where you can buy things and souvenirs. Visit the nearby situated Kodaikanal Lake and other attractions. Guides may or may not be available at the temple but you can always about this site from the temple priests. Summer is the idyllic season to visit this temple because then you can explore it both in the morning and evenings as to avoid winter fog during the chilly evenings. If you want to go around Pongal, then winter are also quite moderate to explore Kurinjiandavar temple. The temple is just 5 km from the Kodaikanal bus station and is 3 km from Kodai Lake, so you can arrive at the lake first and then visit the temple. Also, Kodaikanal Road Railway Station is at the distance of 2 km from the temple. Kurinji Andavar Temple was constructed in 1936 by a European woman who became Hindu, was named as Leelavathi and then married Mr. Ramanathan. She is also endearingly called as Lady Ramanathan. Vagai Dams and Palani Hills surround this divine temple and being here will give a quaint view of the splendid Palani Hills and the picturesque vistas all around. The Kurinji Flower which is well-known here is said to blossom every 12 years and is found in the hills. Moreover, the flower is a cure to many health problems in the months when it blossoms. With the idol of Lord Muruga who is the chief deity here, there are also the idols of nine planet gods situated here. The minute carvings and lovely paintings situated within the temple are just magnificent and are sure to make go wow over them. 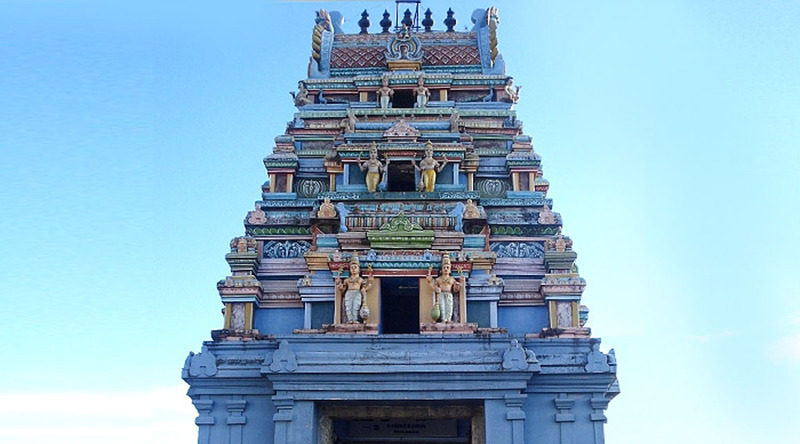 Hence, Kurinjianadavar Temple with its scenic surroundings is one of the beautiful temples of Kodaikanal and will surely leave you spellbound with the mesmerizing aura of this place. Don’t miss the Kurinji flower and explore Kodai Lake after visiting the temple and making your journey a blessed one with its divine aura! Happy journey!